Kallappam (Vellayappam) is a traditional Christian breakfast in Kerala. This soft, tasty pancake is made with fermented rice and coconut batter. Usually, fresh toddy (Kallu) is used to ferment the rice batter. Since, it is not possible to get toddy here, I use yeast. It is still soft and fluffy, but you don’t get that same divine taste. I have not had a chance to devour Kallappam made with Kallu in recent years, but still remember feasting on the same, years back. 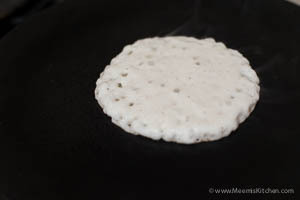 Some people confuse Kallappam with Vellayappam or Vattayappam which is a sweeter and steamed delicacy popular in Kerala. Vellayappam, Palappam with Aval, Neer Dosa, Palappam, Idiyappam,soft Idli, Unda and chammanthi, Poori Bhaji, Puttu are all favourite breakfast items in Kerala cuisine. In most Kerala Christian homes, Kallappam, Vellayappam, Palappam and Vattayappam are all part of festivals like Easter or Christmas. 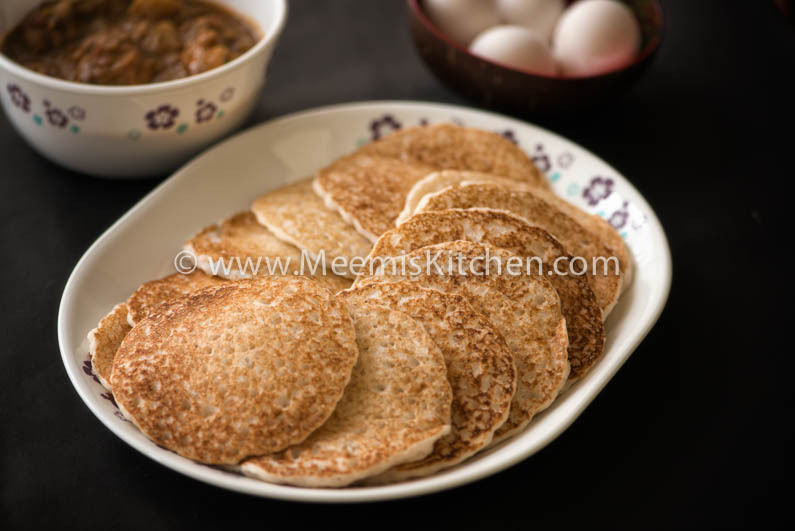 Easter breakfast comprises of Palappam or Kallappam with Tharavu Roast or Mutton stew or Nadan Chicken curry. Idiyappam is another favourite item. We also make Pesaha Appam/ Indari Appam as part of Easter celebrations, which is only made once in a year, on Maundy Thursday, which is a holy religious tradition. Kallappam was not my very favorite dish during my childhood, as I preferred Palappam. But when I started cooking, it felt very good and it was very simple. So, now I make it more often than before. But still, my kids like Palappam and Vellayappam better. In the genes, I guess. Can’t complain. Hope their taste buds will appreciate everything as they grow up. Do check my link for easy Aval Palappam, for crispy, lacy Palappam and super soft Vellayappam with sago. Although it is a breakfast item and tastes yum with Egg Roast, or Egg Curry with potatoes, I make it mostly for dinner. With some Naadan Chicken curry, Beef Curry , Mutton Curry or chicken with Thengakoth, the hot, soft Kallappam is a quite delicious meal. Enjoy!! Small onion : 2 nos. Grind the coconut with cooked rice, yeast, sugar and small onion adding luke warm water. Mix this to the Rice Powder and mix with luke warm water. 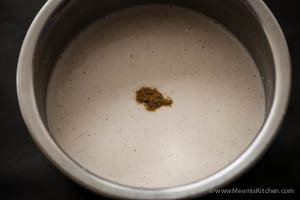 When it is thoroughly mixed (Idli batter consistency), add one pinch Jeerah powder. Mix again and keep it covered for 5 hours. Once it is leavened, add enough salt and mix. 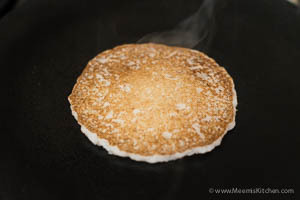 Heat Dosa pan, rub with the oil spreader, and pour one ladle full of batter and cook for one minute in slow fire. Turn the other side and cook till golden brown colour. The soft, fluffy Kallappam is ready. Add only 1- 2 small onions. More onions will spoil the taste. I have added almost 1 coconut in this recipe. The more the coconut, the more soft and tasty it will be. Only lukewarm water should be used. Sweet Toddy is best for Kallappam, You can add it instead of adding water and yeast. Yeast used is Instant yeast. 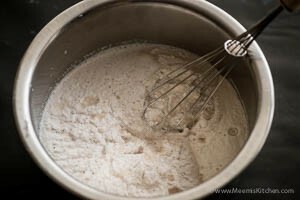 If you are using dry yeast, add 1 tsp to lukewarm water with sugar and keep it sometime for rising and mix with the rice powder and coconut. Also keep it covered for about 6-7 hours. Sugar can be adjusted as per your taste. Have tasty fluffy Kallappam with Nadan Chicken curry or Egg roast. God Bless! I like your food blog..:) all the best! Hi Jane, Thank you for letting me know you like posts. For Kallappam, it is better to grind coconut, as the batter should be thick. But you can add thick coconut milk and add little more rice than mentioned and make it. If you have some thin Rice flakes (Aval) try that instead of coconut and add coconut milk for taste. All the very best.